Gold is the bee's knees in China. As well as being the biggest producer of gold in the world it is also one of the largest importers of gold with a 76% increase to 1054 tons of gold reserves over the past five years and last year gold production hit a new record with over 340 tons produced. That's over eight percent on the previous year making China the world's top gold producer after overtaking South Africa in 2007. The official reserves last reported in April 2009 were 1,054 tonnes. The state-run Xinhua News Agency recently cited the China Gold Association as saying last year's output was 340.88 tons, an increase of more than 26 tons from the previous year. The report also says China's top gold-producing provinces last year were Shandong, Henan, Jiangxi, Yunnan and Fujian. China also imports gold by the ton each year buying up much of the gold sold by western banks and holdings. Marcus Grubb, managing director for investment at the World Gold Council, pointed out, at a recent industry briefing, that the cultural importance of gold is both a luxury purchase as well as an investment vehicle throughout Asia and particularly in India and China, and is likely to be a key driver of continued price increases over the coming years. 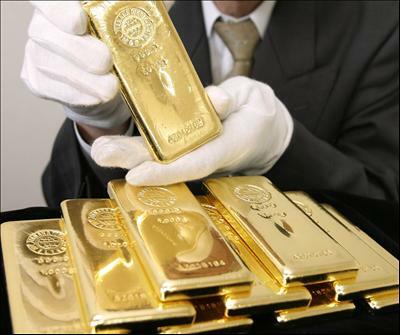 "India and China account for 40 per cent of global demand for gold," Mr Grubb said. "These markets are vital to underpinning prices. Even though it is a discretionary asset, there will not be big differences between [the performance of] gold and copper, for example." He added that, as inflationary concerns grew across both emerging and developed markets, investing in gold could prove beneficial as it, "has a great history as a hedge against inflation." John Chatfield-Roberts, the chief investment officer at Jupiter Asset Management, also agreed that gold was not experiencing a bubble. Instead, he claims more money has been invested in bonds in recent years than had been put into equity funds at the peak of the tech bubble. A sure indicator that gold is considered more stable than bonds, which are more subject to the of the financial markets. He added: "Tesco has just started a small gold valuation business - I'd be more worried if they started wanting to sell that gold." Another factor driving the gold price upwards, Mr Grubb pointed out, was the falling rate of discoveries of new gold sources. According to the Metals Economics Group, the amount of new gold discovered fell from more than 90 million ounces in 1997 to less than 10 million ounces in 2008 and has continued to fall. This can only add to the gold price in the long term. In fact With the world government bond supply at $30 trillion and the world gold inventory at 4.8 billion ounces, you can make a very good case for gold being valued around $6,250 an ounce. Recently China located a massive gold mine in the Inner Mongolia Autonomous Region. According to some experts, the deposit may contain more than 100 tons, and its potential economic value is expected to be more than 35 billion yuan. The Chinese new year is here and that also gave a boost to china's gold assets. "Sales volume of gold jewelry and collectibles, especially gold bars issued for the Year of the Rabbit, was much larger during the holiday week," Liu Yan, a sales woman with Chow Tai Fook Jewelry Co, a popular jewelry retailer in China, at New World Department Store in Beijing, told the Global Times. For example, one customer, by the name of Zhou spent around 3,600 yuan ($549.28) for a 10.01-gram (0.322 ounce) gold bar with a rabbit motif at the store. "I will give the gold bar to my grandson as a New Year's gift," Zhou said. Beijing Caibai, a popular jewelry department store had customers queuing during the holiday period to buy gold and gold sales increased tremendously during the holiday, Niu Jingqi, a manager of sales with Beijing Caibai, told the Global Times recently. China's gold output in 2010 totalled 341 tons, up 8.57 percent over the previous year, according to the latest data filed with the China Gold Association. And gold imports jumped nearly five times in the first 10 months from the entire amount shipped according to the Shanghai Gold Exchange. "The central bank may now be approving all gold import applications", Albert Cheng, managing director of the World Gold Council's Far East department, said in an interview a while ago. "The government hasn't officially said that China is encouraging private gold investments, but we in the industry suspect it. And you can see the big jump in the delivered gold imports through the exchange has to be approved by them." According to Liu Yangyi, head of the trading department at China National Pearl Diamond Gem & Jewelry Import & Export Corp, "Chinese consumers have become much more sensitive to inflation, and (purchasing) gold could be an effective measure to hedge inflation." Increases in gold output will help the country hedge against financial risks and inflation, and also maintain economic security, the association said prior to the Spring Festival. The average gold price in the international market in 2010 was $1224.53 per ounce, 25.6 percent higher than in 2009, according to the China Gold Association. "Gold prices will probably increase 5 percent in the first quarter this year, with an average increase of 10 percent this year," Liu predicted. "Given China is the world's biggest gold producer, the sharp increase in its imports is a big surprise," said Hiroyuki Kikukawa, general manager of research at IDO Securities Co. in Tokyo. "People there need to buy gold to hedge against inflation as the country's tightening monetary policy drives investors from stocks and properties to gold." It seems then that with the purchasing of other countries gold reserves, mining and hoarding their own gold, China is evidently determined to be the largest holder of gold in the world and equally determined that they will not be subject to the same financial woes as the western world. It seems this is one time when Gold Bulls in a China Shop is considered a good thing, at least in China.